Happy Friday! 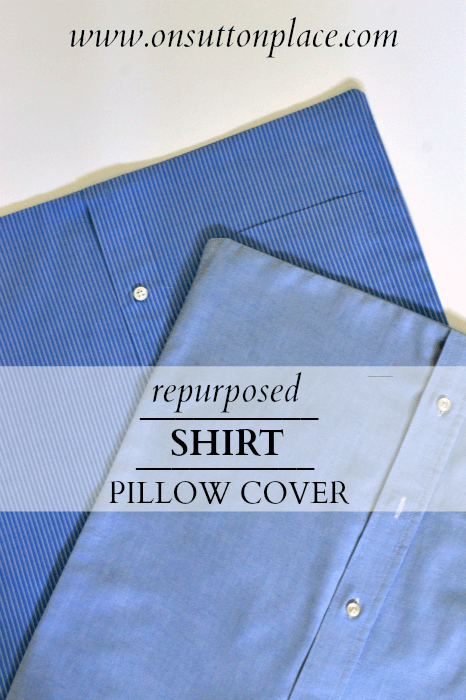 Welcome to On Sutton Place and an easy tutorial on how to make a repurposed shirt pillow cover from a men’s button-up shirt. This is a fun, fast project and the only sewing skill you need is the ability to sew a straight line! Actually, if it’s not exactly straight it doesn’t even matter. Pillow covers are very forgiving. Most flaws or imperfections go unnoticed after the cover is stuffed with an insert. I raided my husband’s closet and chose two blue shirts he hasn’t worn in forever. Another great source is your local thrift store. Many times there are racks and racks of button-up shirts for just a few dollars each. 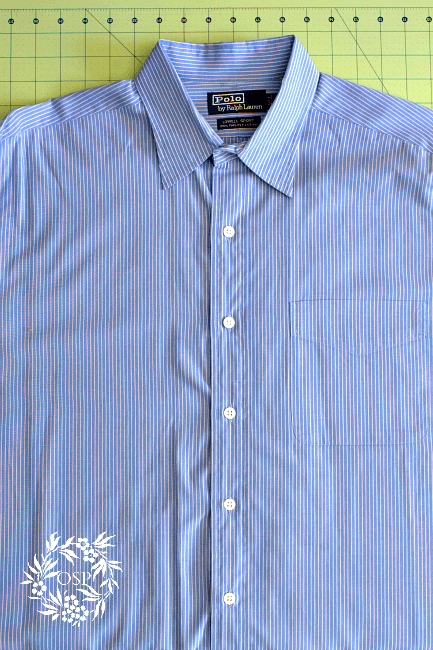 Begin by placing the shirt on a flat surface and straighten it out as best you can. Make sure it’s buttoned up. The next step is to make a template or pattern. I have tried many different ways to cut out patterns and the easiest by far is to simply trace a template. 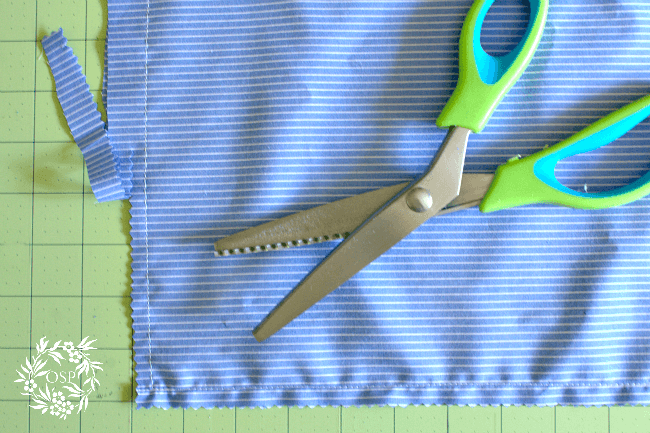 This method eliminates the need to pin the pattern to the fabric. Most men’s shirts measure about 22-24 inches across the chest. In order to leave yourself a little wiggle room, the biggest pillow cover you should attempt is 18 inch. I have found that the two best sizes are 18 x 18 and 12 x 16. Poly inserts in both sizes are readily available at discount and craft stores. To make the template, use cardboard or poster board and cut out a square that measures 19 in. x 19 in. This will allow for a 1 in. seam allowance on all four sides. 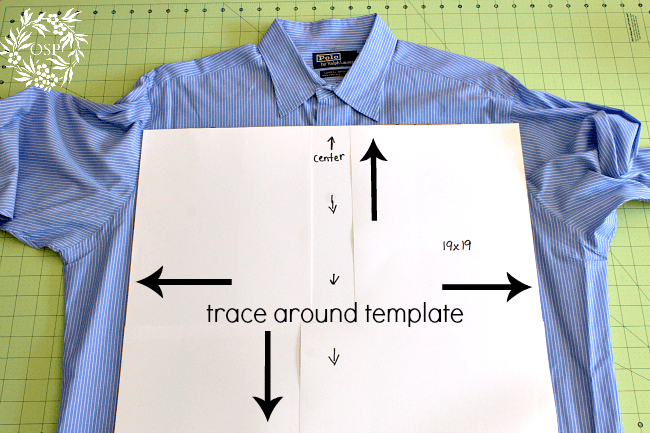 Place the template on the shirt taking care to center the buttons. Trace around the template and cut out. Helpful Hint: make sure to place the template high enough so the pocket isn’t cut off! You will have 2 squares measuring 19 x 19. Place the squares right sides together and pin. Sew a straight line around all 4 sides. 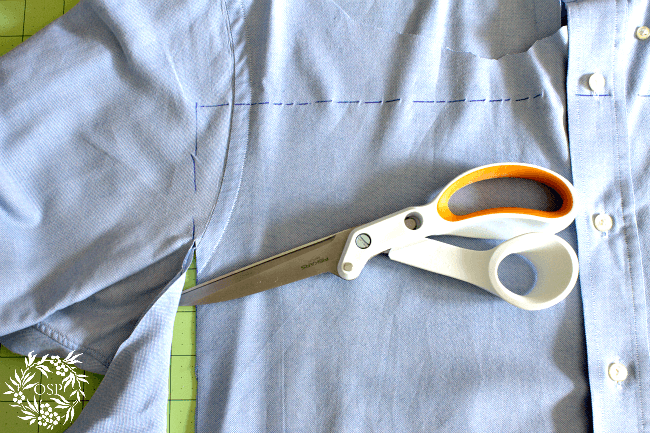 Remove the pins and finish the raw edges with a serger or pinking shears. Unbutton the front of the pillow cover, turn and press. 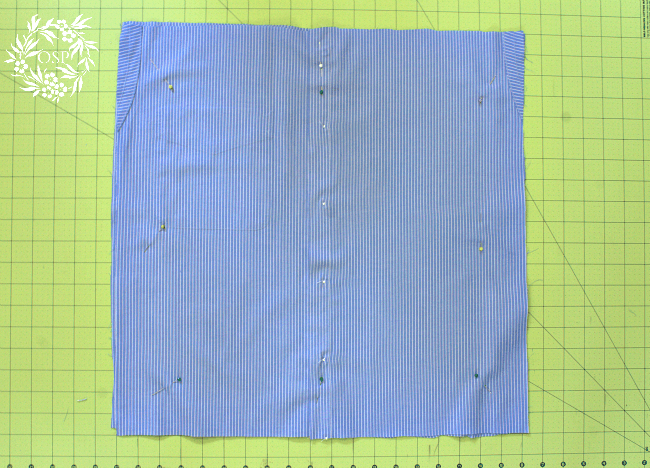 It’s best to leave the front buttoned until after the sides have been sewn. It’s very easy to unbutton it even while it’s inside-out. Once you have your templates made these pillows go together very quickly. I recently completed a project for my cousin and these shirt pillow covers played a major role. Barbara, my cousin, lost her husband to a freak infection a few years ago. He was in perfect health and in his early 50’s. Just last month, Barbara became a grandmother for the first time. It was bittersweet because she was so happy for her son, yet it seemed unfair that her husband wasn’t there to share her joy. She asked me to make something for the new baby from shirts that had belonged to her husband. At first I wasn’t sure what to do. That pile of shirts sat on my sewing room floor for weeks. I finally had to just begin and see what I could come up with. A higher power was with me during the hours it took to complete that project. The end result was 2 baby quilts, 2 shirt pillow covers and 3 Christmas stockings. It had been years since I had quilted anything, but I guess once you learn something like that, you never forget. There was nothing but the collars left from the 8 shirts Barbara gave me. Barbara said on the day of the baby’s baptism there were many tears shed when she presented her son with the gifts I had made. Good tears though. Even though he was gone, her husband was able to share in that special day. How much fun! I’d love to have one made out of an old flannel shirt for winter….so soft! I love this idea! I’ll have to admit that I got a little teary when I read the story behind your project. I’m forever donating gently used shirts like this and can now reuse some of them for pillows. What a special gift that was! I loved your story. This is an example of the very reason I am drawn to your blog…your genuine character comes through naturally. No razzle dazzle, just real life stuff. I like that. Thank you so much for this comment. It means more than you can know! What a wonderful post, thats a lucky and loved little baby! What a fabulous idea!! Thanks for the tutorial! My daughter who just got married, is working on degirlifying her apartment. I will pass this fun idea on to her. IS NOTHING SAFE? 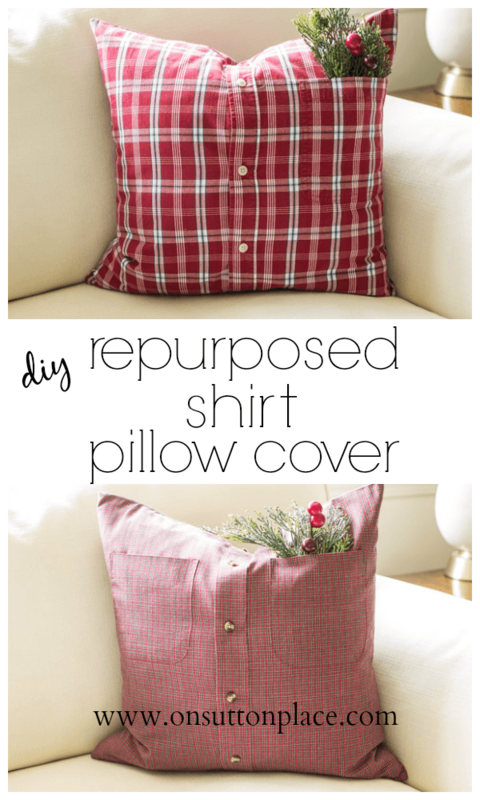 I just love your repurpose shirt pillows. My DH is a plaid guy, so I have wonderful shirts to choose from anytime. Ann, since I am a quilter, when we shop DH always asks me “Would this make a good quilt” … You should see the looks we get! Love it. I really think this is one of my favorites. I am thinking flannels for winter time how cute those would be too! Flannels are perfect for Christmas and winter! Hope to make some for my shop. I was very moved by the story about your cousin’s husband. What a lovely idea to use his shirts to create all those wonderful gifts. I’m going to try to find a couple of shirts to do this project (will have to hit the thrift shop though; the men in my life are 11 and 7 years old!). I have saved a bunch of my late brother’s ties. Any ideas for using them? A pillow cover, or…..? Let me know what you think. Thanks so much for your wonderful blog. I always enjoy hearing from you. 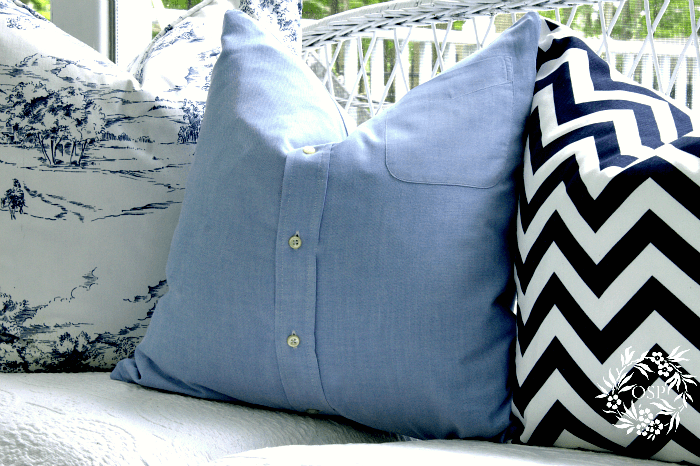 What a wonderful idea to make these shirt pillows. Such a memorable gift! Wonderful job! Ann, even before I got to the end about using these as gifts I was thinking of a dear friend who lost her husband to cancer this spring, and that I wanted to do one for her! Thank you for such a lovely idea! You are welcome! I think it’s a fitting way to use favorite shirts or pieces of clothing. Keeping them stored in a bin somewhere, not used,doesn’t do the memory justice. Thank you for stopping by and taking the time to comment! Ann, you had me in tears with your story about the baby quilt! Your talents serve a real purpose, giving comfort in so many ways. What can be more fulfilling? I can just imagine how wonderful it was to have all of those memories from the shirts. That was a great idea. This tutorial was so easy to understand. Thank you! p.s. one of my recipes is in competition for a magazine piece….if you have time, can you stop by my blog before Sunday evening for a link to the site to vote for me? Thanks! 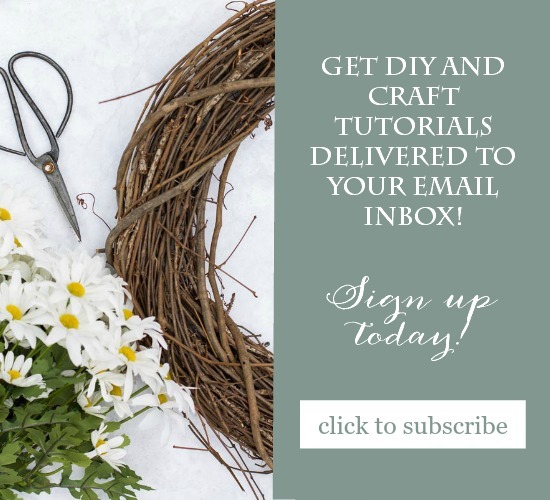 The idea is great, and I love the look – but best of all, Ann, is the wonderful inspiration you received to make such a meaningful gift for your cousin. There’s a lump in my throat. Beautiful story of repurposing the shirts. I’ll bet the baby quilts were beautiful. Great tutorial and great pretty pillows. Thanks. Oh my gosh, Ann, you made me cry…What a perfect idea! That’s such a great idea. Love the look.